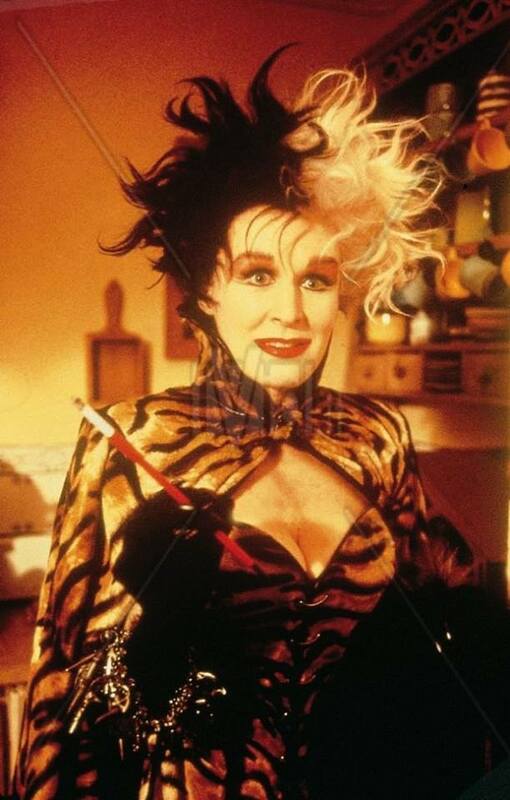 A couple of blog posts ago I talked about how my sister was interested in making a recreation of the tiger print outfit worn by Glenn Close in the 101 Dalmatians live action movie for Halloween. Well here is an update with some progress and finished pictures of her outfit! When my family came to visit in September, Melanie and I spent an afternoon in the sewing lab working on the draft of her cape. The final pattern pieces ended up slightly different than the original sketch. We changed the underarm portion of the cape to tie around her shoulders in the back to support the weight of the cape. Melanie also decided she wanted to have a traditional cape shape with slits for her arms instead of the folded over sleeve we talked about in the original post. I developed the patterns by draping excess fabric on her shoulders and drawing in the lines I wanted. I then had her make paper versions of the muslin pattern pieces. Now Melanie has some sewing experience, having worked at the University of Rhode Island's costume shop while she was in college. The only hand I had in the creation of her costume was the development of her pattern. Once she had the pattern she took it back to Rhode Island with her and sewed the costume on her own. She did an amazing job and I am so proud of her! She used a commercial corset pattern (McCalls 5797) and altered the bottom for the correct shape. The corset is made out of velboa, lined in black denim, edged in faux leather, and boned with plastic zip ties. It zips up in the back. She found fake plastic bird talons, painted them and attached them to the front of the corset. The corset has a "faux" black panel on the front to make it look like it opens. She made the cape out of two types of velboa, and lined the edges with the faux pleather. The collar has boning sewn into it to maintain its shape. She also made the skirt out of the pleather and the amazing bracelet out of various metal findings! I love all the detail work she put into it! Not pictured: Melanie as Cruella with my two nieces (3 years and 2 years old) dressed up as dalmatians for Halloween!! For those who don't know, I have a younger sister who is CRAZY about Glenn Close, Maria Friedman, Julie Andrews and Gertrude Lawrence. She runs her own blog dedicated to these ladies and more over on Tumblr under the name LadyLizaElliott. She has some sewing experience, having worked with the University of Rhode Island's costume shop for a number of years, and having me as a sister :) She does not cosplay much, but she has always wanted to make one of the gorgeous costumes Glenn Close wore as Cruella deVil from the live action version of 101 Dalmatians. She decided to finally tackle making one of the costumes this year after my sister in law agreed to dress her two adorable daughters (1.5 and 2.5 years old) as dalmatians for Halloween if my sister dresses as Cruella. My sister had the chance to visit the Glenn Close costume exhibition on display at the Muscarelle Museum of Art at the William & Mary University earlier this year. 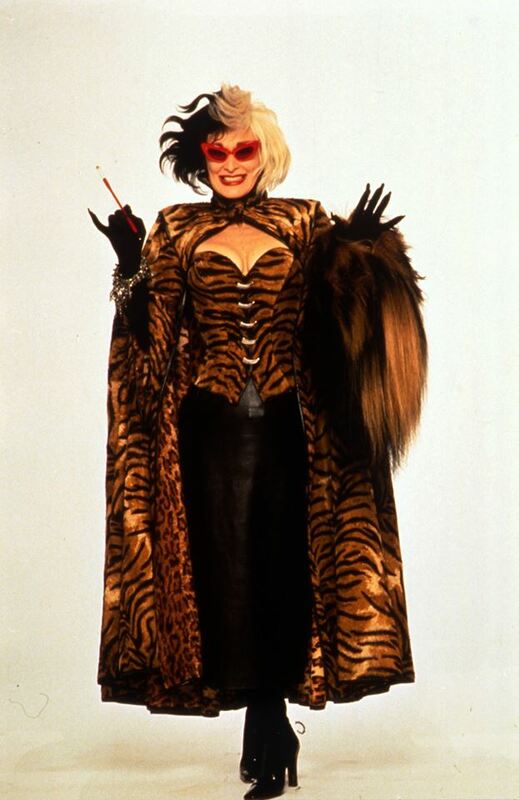 She was able to see a number of Cruella costumes up close, and came away with her own costume notes and was generously given one of the full sized cardboard cutouts of the tiger printed corset and cape. It now sits displayed in her closet in her room. After much debate she decided she'd like to recreate the tiger printed outfit for her Halloween costume. 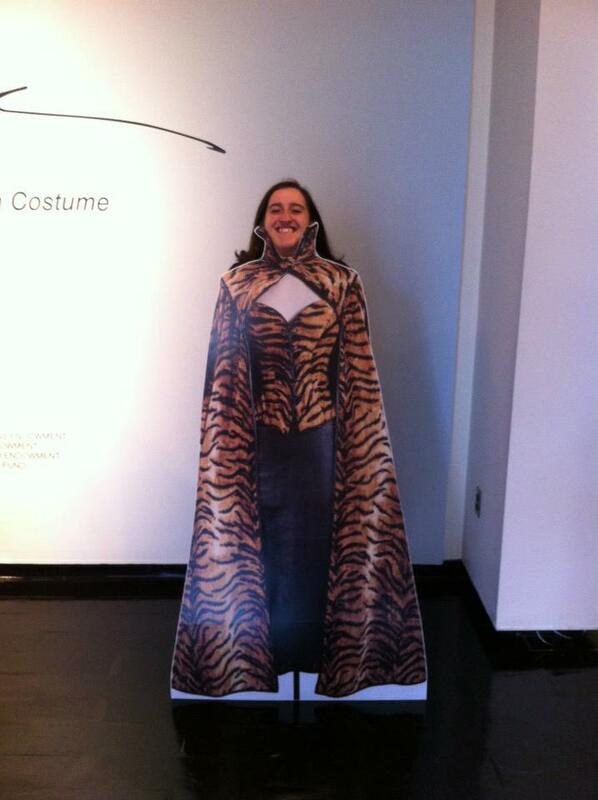 She contacted me asking tips on how to construct the cape of the ensemble. As I began to break it down I decided to document my findings here for others to see! The first thing I'd like to point out is the way the sleeves on the cape are constructed. The first two photos are the best for viewing how they are put together. Take note of the binding surrounding the end of the sleeve. It looks like the back of the cape is tacked to the front of the sleeve at a corner in the front. If you follow the pivot of the binding at the wrist towards the underarm or bottom of the armseye you can see that the binding ends under her armpit. Looking at the picture of the back of the cape there is no indication that the binding is attached to the back anywhere but at the wrist and underarm. To get a better idea of this imagine draping a towel over your arm with one edge hanging longer than the other. Then pinch the shorter corner to the part draped over the back. I think this is how her cape is constructed. In this shot it is clear that there is a seam at center back on the collar and the center of the cape. There is likely a side seam at the collar in order to get that exaggerated curved shape. Take note of the binding at the side of the armhole. It does not continue all the way around the armseye, which further points to the idea that the sleeve just wraps around and tacks down under her arm instead of being sewn in as a traditional sleeve. This is a shot of the costume from the movie that I lightened so you can see the cape better. Take note of the direction of the tiger stripes here. There is a distinct difference in the direction of the stripes from the sleeve portion and the center back panels. This indicates that there are seams down the back of the cape. It is likely that the cape is constructed in four pieces: two sleeves and two back panels. The seam connecting the back panels to the sleeves likely runs in line with the armseye seam along the back of the yoke. I did not do any research into the way that the cape closes since my sister got to see the costume up close and has a much better idea of the closure and the brooch that is at the neckline. To try and illustrate all these details a little easier I did a very rudimentary sketch. This is by no means meant as a definite illustration of what the cape actually looks like, it is just my interpretation in order to hopefully make everything a little easier to visualize. I also did a very basic sketch of what some of these patterns would look like. Again, this is just for reference and not to scale or the exact shape. These are just for visual reference. That's all for now. 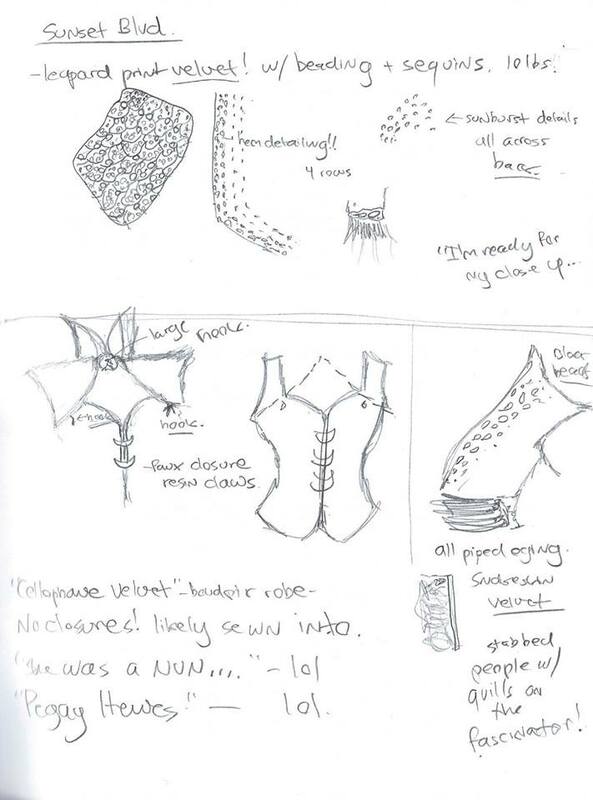 I will keep updating with new information and progress as she works on her costume!